This is a thread for wild edibles. But make sure you know the plant well and tell unique characteristics, if theres a poisonous look a like and what makes them different. Dont forget to say how to prepare them. 1.Open up the leaves in early spring to reveal the shoots. Once the fibrous green are peeled away, the white meat is visible. It can be eaten fresh of steamed. You can dice it or slice it to add to salads, too. 2.Scrape the slime from those shoots onto a cookie sheet and let it dry in the sunshine. This starchy substance is a good soup thickener and can be stored in its dry form for a long time. 3.Later in the year, when the flowering stalk grows, you can steam the green male flowering tip and eat it. It's been recommended that you dip it in butter, because it can be rather dry. 4.After the pollen develops, you can shake it off and add it to flour to make pancakes, muffins, cookies or other baked goods. The pollen can be encapsulated and taken as a supplement, similar to the popular bee pollen energy pills hat are popular. 5.After the flowers have gone to seed, parch the fluffy stuff so that the seeds get nice and toasted. Sprinkle them on salads or eat by the hand as a tasty toasted nutty snack. 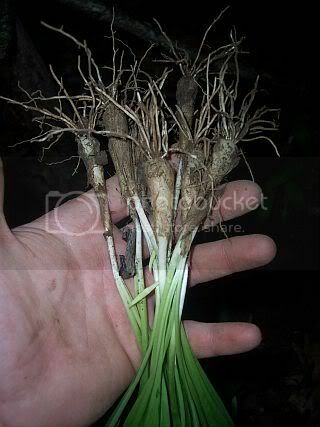 6.Dig up the root masses in the winter and scrub them clean. Smash them into a pulp and soak in water to extract the starch for a high energy soup thickener. Please understand there is always a risk in eating anything wild. i my self have never eaten these but i sure know alot that have eaten them and enjoy these cattails.. When you say, leaves. Do you mean the long ones that are 1/2 an inch wide? yes hap all the long green blades are considered leaves. Ok. What parts are edible in the spring? The blades? Thanks. I'll have to make a video on it this spring. Happer and M5, one thing to remember is that there is other plants that look like young cattail plants that are poisonous. Yellow Flag is one of such plants. I am at work right now but will do more research. But Google Yellow Flag and or other poisonous aquatic water plants. What are the ways to tell them apart? Happer, i don tlike saying to look it up. but i woul dnot do it justice explaining them. Visit your library and check out some books. They best way is to study. 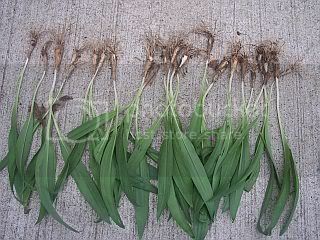 I love me some ramps! Scott. I looked it up and tell me if I'm wrong. But Yellow Flag looks shorter and looks like the leaves are thinner.. I just saw that from the pictures. And also it showed they have yellow flowers. Do they grow right away or later in the year? Yes happer when the Cattail is very young looks alot alike. there is other water plants you do not want to eat. They can make you very sick and or kill a person. Do you have any idea how to tell them apart when there young? Yes Happer I do, but it would be to hard to explain it. Ok. Where are these photos of the willow?